"Special Levels" redirects here. For information about the type of level in Mario vs. Donkey Kong: Minis March Again!, see Special Level. Rainbow Summit is a special bonus world and the tenth attraction in Mario vs. Donkey Kong: Mini-Land Mayhem!. This world takes place in the sky, with white clouds, colorful hills, and rainbows seen in the background. 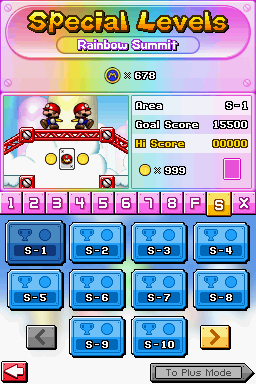 The player must collect a certain amount of M-Tokens to unlock new levels in this world. Levels in this attraction, also referred to as Special Levels, are played out differently from the rest of the game. Like the Plus Mode of Mario vs. Donkey Kong: Minis March Again!, the player can only begin modifying the environment after all Minis are set moving at once by pressing "Start" at the beginning of a level, instead of being able to modify the environment whenever ready and activate the Minis individually. There are twenty levels in both Normal Mode and Plus Mode. Enemies here include Fire Piranha Plants, Shy Guys, Pokeys, Thwomps, Circus Kongs, and Spikes. Objects include Conveyors, Springs, Magnet Blocks, Warp Pipes and Blockers. The music that plays in this attraction is the music that plays in Teatime Twirl, Cannon Cove and Coaster Hills. This page was last edited on April 22, 2019, at 11:43.